For decades, Janome sewing machines have delighted home seamstresses with their reliable functioning, affordable pricing, and useful features. Janome machines are still very popular today, and this company may produce a model that perfectly meets your sewing needs. The Janome Sewing Machine Company, located in Hachioji, Japan, has been producing sewing machines for customers all over the world since 1954. This company prides itself on new innovations, claiming to be the first to manufacture a programmable, computerized home sewing machine back in 1979. In addition to innovative features, Janome is dedicated to making sewing approachable for seamstresses of all experience levels. The company makes everything from basic sewing machines to fully-featured embroidery and long arm quilting machines. SewVacDirect - Offering more than 300 Janome project, this is a good place to buy any of the Janome models. Typically, you'll save between 15% and 40% off of the suggest retail price. Amazon.com - This major online marketplace offers almost every model of Janome machine, most at great prices. You can also read user reviews of the machines to help pick the one that's best for your needs and budget. 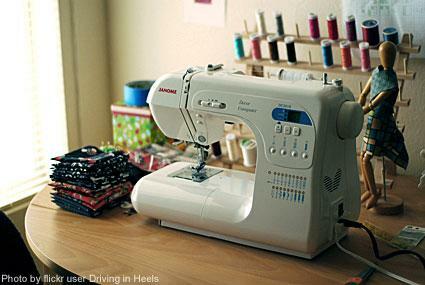 Sewing Machines Plus - This popular retailer sells the full line of Janome machines. Many models are significantly discounted, and delivery is free. Although most Janome is popular with consumers, certain models stand out as best sellers. According to Amazon.com the following models are the most popular. Reviews on She Likes to Sew are also very positive. Competitively priced at between $300 and $400, the 7330 Magnolia includes 30 pre-set stitches, as well as many features designed to make sewing easy. These include free-arm sewing capability, an automatic threader for the needle, easy stitch adjustment, and automatic bobbin winding. Additionally, you have the option of controlling this machine with a push button instead of a floor pedal. Although the manufacturer's suggested retail price is about $750, you can find this machine on sale for much less. It includes 50 pre-set stitches, a handy hard case, and several accessory feet. In addition to automatic needle threading, automatic bobbin winding, free-arm sewing capability, and simple stitch adjustment, this model features a pattern stop button that ensures you always complete the pattern on fancy stitches. If you're more interested in a mechanical sewing machine than a fully computerized model, the HD1000 may be for you. It features 14 pre-set stitches and manual adjustments for thread tensions, stitch width, and more. The body on this machine, which sells for about $300, is constructed entirely of aluminum. It also has free-arm sewing capability, an automatic needle threader, and lots of accessories. At about $120, the Janome 2212 is a very affordable option. Although this machine doesn't come with the bells and whistles of more expensive models, it does include many useful features. It has 12 pre-set stitches and is controlled with manual dials. At 20 pounds, it is lightweight enough to carry from room to room in your house. If you're looking for a machine that can handle heavy-duty projects and quilting, the MC-6300P may be a good choice. At about $900 it is a significant investment, but it boasts lots of useful features. Capable of sewing at up to 1000 stitches per minute, this machine has a large sewing bed to accommodate quilting and a thread trimmer that automatically cuts the thread when you are done sewing. There's also a separate bobbin winding motor to allow you to wind a bobbin while you're sewing. It comes with many extra features and accessories. Whether you're just learning to sew or are a master quilter, finding the right machine is all about choosing the features that fit your life. Before you buy a Janome sewing machine, consider how you'll use it and try out some Janome models at your local craft store. Research and in-person experience are all it takes to find a sewing machine you'll love for years to come.